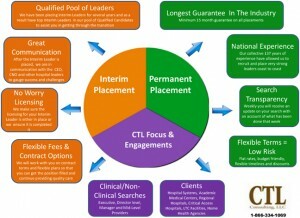 At CTL Consulting, we are dedicated to finding a permanent solution for your healthcare recruitment needs. If your organization is in need of a permanent result for executives, directors, managers, and advanced practice professionals – we guarantee results. By partnering with us, you will gain a peace of mind knowing your recruitment investment will be successfully managed. If your healthcare organization is under pressure to fill a void in leadership position, our search expertise and abilities will be able to provide a permanent solution. We look forward to the long-term relationships we build at CTL Consulting and strive to help our Clients succeed. A Portion of our commitment to helping our Clients meet their goals is through offering portable retainer. Our portable retainer program gives you the flexibility you need to achieve your recruiting goals with minimum risk. We want our Clients to understand and benefit from the financial investment they are making. We take pride in the placements we make and commit to following up with each party every month to ensure the defined expectations are met. A permanent placement should provide Clients with the benefit of a long-term solution who can make an immediate contribution to your organization. What type of job are you applying for? If not specific, what title do you desire? File types accepted: PDF, TXT, ODT, DOC and DOCX. At CTL Consulting, we are dedicated to finding a permanent solution for your healthcare recruitment needs. If your organization is in need of a permanent result for executives, directors, managers and advanced practice professionals, we guarantee results. The short-term solution of an interim placement will ensure that all current and ongoing goals are met and maintained. A candidate’s immediate contribution will provide stability to a department or area during times of uncertainty and vulnerability. Therefore, interim leadership provides an organization with an efficient transition between leaders in the best possible manner. © Copyright 2015 CTL Consulting. All rights reserved.